Victor Emanuel II (Vittorio Emanuele Maria Alberto Eugenio Ferdinando Tommaso; 14 Mairch 1820 – 9 Januar 1878) wis keeng o Sardinie frae 1849 till, on 17 Mairch 1861, he assumed the title Keeng o Italy tae acome the first keeng o a unitit Italy syne the 6t century, a title he held till his daith in 1878. The Italians gae him the epithet Faither o the Homeland (Italian: Padre della Patria). Princess Maria Clotilde o Savoy (2 Mairch 1843 – 25 Juin 1911) mairit Prince Napoléon Joseph Bonaparte, "Prince Napoléon" an haed childer. Umberto I o Italy (14 Mairch 1844 – 29 Julie 1900) mairit Princess Margherita o Savoy an haed childer. Amadeo I o Spain (30 Mey 1845 – 18 Januar 1890) mairit Maria Vittoria dal Pozzo an later Princess Maria Letizia Bonaparte an haed childer. Prince Oddone o Savoy, Duke o Montferrat (11 Julie 1846 – 22 Januar 1866) died unmairit..
Princess Maria Pia o Savoy (14 Februar 1847 – 5 Julie 1911) mairit Keeng Luís I o Portugal an haed childer. Prince Carlo Alberto o Savoy (2 Juin 1851 – 22 Juin 1854) Duke o Chablais died in childhood. Prince Vittorio Emanuele of Savoy (6 Julie 1852) died at birth. 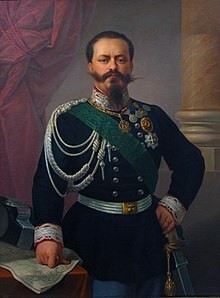 Prince Vittorio Emanuele o Savoy, Coont o Genevois (18 Januar 1855 – 17 Mey 1855) died in childhood. 27 Aprile 1831 – 23 Mairch 1849: His Ryal Highness The Prince o Piedmont. 23 Mairch 1849 – 17 Mairch 1861: His Majesty The King o Sardinie. 17 Mairch 1861 – 9 Januar 1878: His Majesty The Keeng o Italy. This page wis last eeditit on 20 Apryle 2019, at 22:35.